Dr Haushka organic skincare is formulated and prepared in such a way that no synthetic preservatives are required to keep the products shelf stable and they’ve always been this way. Just as they were developing organic, chemical free skincare well before it became a trendy buzzword, they were also producing their skincare free from toxic synthetic preservatives long before the dangerous and health damaging effects of these chemicals became commonly known. Their organic skincare is produced using the following methods to ensure that they don’t need synthetic preservatives, yet don’t allow the growth of skin irritating micro organisms. Natural ingredients with inherent stabilising properties and resistance to spoilage and microbial growth. Quality control and testing or all raw materials at multiple points throughout production. Pharmaceutical grade manufacturing facilities that reduces exposure to any contaminants. Packaging that helps to support product stability. Aloe Vera is the organic skincare industries dirty little secret they don’t want you to know about. For cosmetics and skincare in Australia to carry the Australian Certified Organic or COSMOS organic certification, products must contain at least 95% organic ingredients. Many cheaper skincare products are mostly water with a few active ingredients thrown in. Even if your active ingredients are organic, if your product is mostly water then it fails to the meet the 95% organic ingredient benchmark required for COSMOS certification. Enter Aloe Vera. Organic Aloe Vera is used, often in amounts around 80% to meet the requirements for organic certification. You’re probably a bit shocked that we’re being so negative about Aloe Vera and organic Aloe Vera to boot. After all isn’t it wonderfully soothing and healing to all skin types? It sure is. The problem lies in the fact that when you’re using Aloe Vera in such high percentages in a skincare product you need something strong to control microbial growth. You can search long and hard but you will not find a liquid Aloe Vera product that doesn’t also contain synthetic preservatives such as sodium benzoate. Freeze dried aloe is fine, but as soon as you add water and hydrate it, you need to add something to stop the bugs from growing. The issue is with something called secondary ingredients, this means that an Aloe Vera product containing preservatives may be used, but only the Aloe Vera is listed on the label. Sodium benzoate is the most common preservative used for Aloe Vera and is also a fairly common source of skin irritation and allergy. We have a lot of people coming into our salon looking for Aloe Vera free skincare, thinking they’re allergic to it, but the reality is that their skin is probably allergic to the preservatives that are not disclosed on the labels. 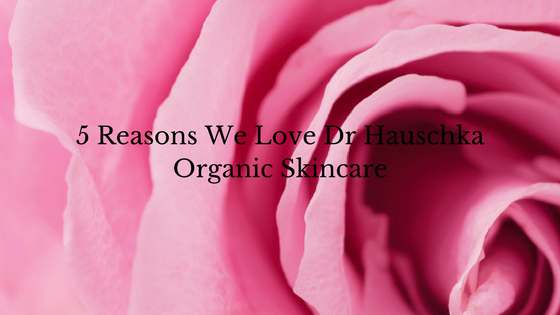 Rather than trying to cover up or mask problem skin, Dr Hauschka organic skincare understands and works with your skins natural rhythms, cycles and impulses. In a world obsessed with fast fixes and antiaging cosmeceuticals this might sound a little quaint and old fashioned, but, believe it or not, skin biology hasn’t changed at all over the last 8 decades or so since Dr Haushka organic skincare was first developed. Your skin is a major living and breathing sensory organ and your environment has a big impact upon its function and health. Skin bio-rhythms include its renewal every 28 days and how it functions differently during daylight hours compared to at night when it enters its regenerative rhythm. Stress in its many forms – emotional, change of seasons, dietary, lifestyle etc can all interfere with these normal skin rhythms, leading to out of balance skin that lacks vitality and harmony. You may have already noticed that you’re more likely to get a breakout of pimples or blotchy irritated skin when you’re stressed before a big event, and, if you’re really paying attention you’re probably already aware that your skin changes as the seasons change too. By working with your skins own natural rhythms and cycles, Dr Hauschka organic skincare helps to bring back balance to your skin by supporting its natural regenerative bio-rhythms. Their organic skincare range harnesses the healing potential of healthy and resilient skin with products designed to work with your skins own rhythms. Supporting sustainability since the 1930’s! Dr Hauschka were way ahead of the game in refusing to use synthetic chemical preservatives and choosing natural and organic ingredients, AND, they also pioneered sustainability long before environmental issues were at the forefront of our consciousness. With their use of biodynamic ingredients, Dr Haushka have been as concerned with the health of the soil and the earth as they have with helping to create beautiful, healthy and resilient skin. These days, 96% of their tropical products such as cocoa butter, coconut oil, carnauba wax and palm oil come from either certified sources or their own organic cultivation projects where fair trade standards are guaranteed. This means no child labour and fair working conditions. In countries such as Afghanistan they work with the World Hunger Organisation to support around 700 farmers to convert to organic farming, primarily roses, as an alternative to opium cultivation. Yes Dr Hauschka organic skincare really does have all the feels covered! 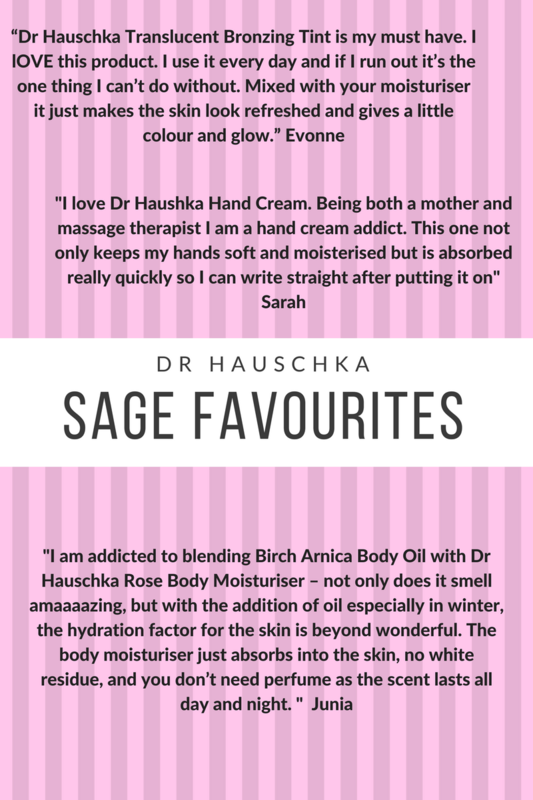 At Sage we LOVE Dr Hauschka skincare and are proud to boast the most Dr Hauschka trained therapists of any salon in Sydney. We have many years of experience using this wonderful organic skincare range in facials and for client’s home use. If you have a question about using Dr Hauschka organic skincare please give us a call, contact us, or drop in to our salon in North Bondi, Sydney.